One of the Hottest Years Ever? Our temperature at DFW Airport hit 103 degrees Thursday afternoon. So now, we have hit 100 or higher on 13 of the past 14 days. And for the summer, we have now seen 100 degrees 21 times. To put that in perspective, in a typical north Texas summer, we will reach 100 only 16 times. So we have already passed that threshhold, and we still have all of August to go. For the entire month of July, our average high temperature was 99.8 degrees, making it the 7th hottest July on record. And if you look at the mean temperature, averaging the low and high temperature for each day of the month, you get an average mean monthly temperature of 89.0 degrees. That is the 4th warmest on record. Furthermore, if you look at the temperatures for every day of this year, from January 1 through July 31, this is now the second warmest year ever, behind only 2006. Lipan, Denton, Navarro, Mexia, Rio Vista, Waxahachie, Palestine, Haslet, Tawakoni, Brazos, Bosque and Montague. Can you think of any more? I would love to hear from you. Until then, I will continue to train my tongue not to be so lazy and get the sound right. By the way, if you ever want to talk like a local in North Florida let me know. I can help you say Fernandina Beach, Sopchoppy, Lafayette and Alachua! I know so cliché, but it is true. This is my first taste of Texas heat, so I started looking back to find out if it is always this hot and this dry. I looked back at last summer and found it was much cooler and wetter. In fact, last July 28th the temperature got up to just 93, not 105 like yesterday. Rain helped keep things cooler. The bucket was full last summer; almost 16 inches fell during June & July. Compare that number to 1.29 inches since June 1st of this year. I have been here for six weeks and it has only rained twice for a total of about 30 minutes at my house. You just look around and see the toll the lack of rain is taking on vegetation. Looking ahead, most of the computer forecast models show dry weather holding steady over us. Let’s hope we see some changes next month. I was asked this question by a viewer’s email today. And I figured I could expand on the response here. As the sun rises and climbs through the sky, the solar radiation gets more intense. The sun is at its highest point in the sky at noon local time (1pm with Daylight Saving Time). At that point, the sun’s rays will cause sunburn in the shortest amount of time. But although the sun’s radiation is at its strongest then, that doesn’t mean that the temperature peaks at mid-day. In fact, the temperature will continue to climb so long as the earth is receiving more incoming heat than the earth is radiating back to space. The temperature will actually peak between 3 pm and 4:30 pm each afternoon, dependent to some extent on variable cloud cover and wind speed. After that, as the sun gets lower in the sky, the temperature will begin to fall gradually back from its high, and the drop in temperature accelerates after sundown. A very similar pattern occurs on a seasonal level. The sun’s radiation is at its greatest for the entire year at the summer solstice, around June 20th. But the earth continues to heat up after days on end of relentless summer sun. And the temperature peaks not in late June, but in late July and early August. This is sometimes referred to as the “Lag of the Seasons”. Sunday’s high temperature at DFW Airport was 105. That makes July 27th the hottest of 2008; the hottest of the summer; the hottest since August 18th, 2006. Our normal high is 96 degrees. We missed the record of 106 by one degree; that was set back on this date in 1944. Monday’s forecast high is 104 which is also one away from a very vulnerable record of 105 set back on July 28th, 1995. We are now up to 17 days this year in the triple digits. Sunday was the third in a row with at least another week of the heat expected. Our first heat wave this summer topped out at 5 consecutive 100 degree days, the hottest of which was 102. In 2006, we ended the year with a total of 41 days at or above 100 and three separate heat waves; the longest of which was 19 straight days. Of course, the summer to beat is 1980. 69 total triple digit days that year including 42 consecutive and every single day in the month of July that year. While 1980 had the most triple digit summer days, 2006 is the hottest year on record from start to finish averaging out all 365 days. 100 degree stats… 2008 is hot, but its no 1980. 2008: If we stay at or above 100 through Friday (8-1) we’ll have a streak of 8 days in a row of 100. 1980: We had a streak of 42 days in a row of 100+. Wow, I remember that summer and heat that scorched most of this part of the country, and it was merciless. We had 69 days of 100+ over that long, hot summer. I admit I “borrowed” that title from the National Weather Service. Their office in Brownsville wrote a summary on the effects of Hurricane Dolly in south Texas this week by the same title, and I liked it. Their story shows an area of 100+ mph winds hit on Padre Island just a few miles north of Brownsville. 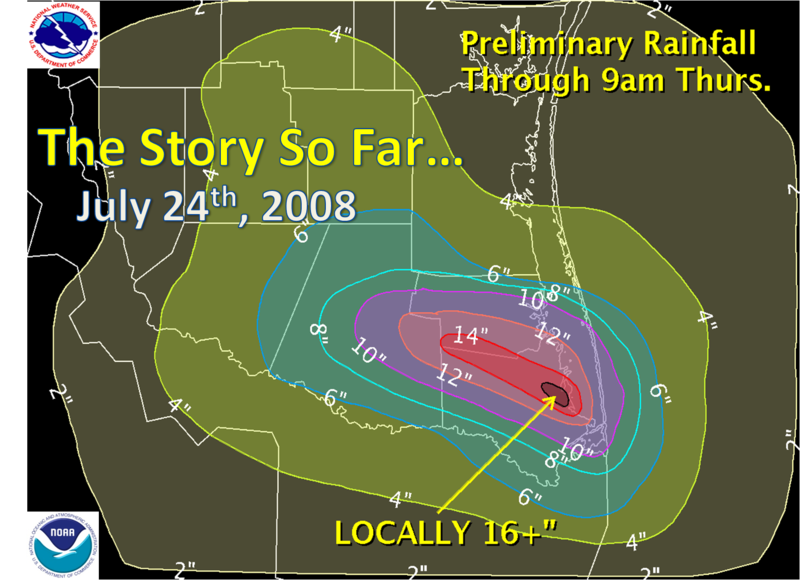 It also included a graphic of the total rainfall from the storm. As you can see, there was a streak of rainfall greater than 14 inches along the path of the landfalling eye of the storm. Hurricane Dolly is poised to move onshore around daybreak, very near Brownsville, Texas. As of 10 pm, the maximum sustained winds had reached 80 mph, with a few gusts approaching 100 mph. Dolly should strengthen a bit more before reaching the coast, with sustained winds expected to reach 90 mph by then. That makes Dolly a strong Category 1 hurricane. Certainly there will be some damage with winds that strong, to buildings, roofs, trees, and to the agricultural crops in the Valley. But there is a silver lining. South Texas has been in a terrible drought this year, and the heavy rains will be welcomed. Too bad they will be accompanied by the strong winds. Sunday’s high temperature was 101 at DFW Airport. That is the 3rd day in a row we have hit the triple digits and the 11th time this year we have been at or above one hundred degrees. The hottest day so far this year is still last Saturday when we got up to 102. 19 of the last 20 days have been at leat 98 degrees. Remember, the normal high is 96 now thru August 13th which is historically (based on 30 year averages) the hottest time of year for North Texas. 2 years ago today, we were still stuck in the middle of an 11 day heat wave the topped out at 107. Last year by July 20th, it was still raining and we had still not hit a hundred. In fact, we did not get to the century mark in 2007 until August. Not much change expected over the next seven days. Every day has a good shot of hitting at least 100 degrees, if not officially at DFW, certainly within the Dallas/Fort Worth area. The summer of 1980 may hold the record for most (and most consecutive) triple digit days, but the hottest year on record is 2006. 2008 is now the third hottest from January 1st thru July 20th. If you take high temperatures only, 2008 is now the second hottest on record. Record Breaking, but well Behaved Hurricane? Bertha is now the longest lived tropical storm in the Atlantic in the month of July. Sixteen days and counting. Bertha continues to spin away out in the open waters of the Atlantic Ocean. Since becoming a tropical storm back on July 3rd, Bertha hasn’t been a threat to anyone except shipping. It did make a move toward Bermuda, but swerved away. Here is a map of the track of the storm, which is exceptionally long-lived for a July storm. According to the forecasters at the National Hurricane Center, if Bertha can stay at least a tropical storm through Sunday (7-20) it will become one of the top 10 longest lived Atlantic storms, regardless of month. Hurricane Ginger in September and October of 1971 stayed a storm for 27 days!